Miller City’s Nick Gable heads the ball over Ada’s Christopher Reyes during Monday’s match at Ada War Memorial Park. VAN WERT — Ottoville’s Nolan German scored two goals and Joe Miller and Dalton Davis each added a score. Ottoville out shot Van Wert 12-2. ADA —Ada’s Jon Allen and Chris Reyes each scored a goal and Isaac Spar had an assist. Drew Hadley recorded 10 saves. CRESTVIEW — Delphos’ Addison Mueller scored the lone goal for the Blue Jays. DEFIANCE — Leipsic won is straight sets 25-14, 25-19 and 25-12. Leipsic’s Hayley Heitmeyer had 15 kills and was 24-27 hitting with four blocks. She was also 8 of 9 serving. Carlee Siefker: had four kills, eight digs and five blocks. Selena Loredo had 13 assists and was 37 for 37 in settings and 17 for 17 serving and two aces. Lyndie Hazelton had seven assists and Kacey Dulle had 12 digs. Brooke brown had seven digs and three aces and Liz Scheckelhoff had three kills and five blocks. ARLINGTON — Bath fell in straight sets 25-22, 25-18 and 25-16. For Bath Eden Adkins had one ace. Mallory Clark had six kills and 11 blocks and Caitlyn Renner had 15 assists. Ada lost to St. Henry 25-23, 25-16, 25-8, 25-10. Ada’s Sidney Gossard had 20 assists, five digs and three aces. Rilan Conley had 11 kills and Raina England added eight kills. Aubrey Madison had three blocks and Morgan Swick had 16 digs. Kendal Guagenti had eight digs and three aces. Miranda Wills had eight digs. Elida’s Riley Creps led the Bulldogs with a 45 while trio of Bulldog linksters, Dylan Buetner, Cameron Collins and Noah Adcok, all fired 46s. For Bath Britton Hall, the medalist, shot a 39 with Cole Padapiano coming in with a 46. Abby Vierra shot a 54 and Annebelle Burkholder finished with a 56. Elida evens its Western Buckeye League mark at 2-2 and Bath falls to 0-2. WAPAKONETA — Shawnee’s Maggie Gray captured medalist honors after shooting a 47 and helped the Indians to a WBL win over Wapakoneta. Other Indian scorers were Taylor Burgess, 53, Morgan Altenbach 55 and Jeanna Fullom 55. For Wapakoneta Taylor West shot a 51 with Addie Place scoring a 56. Allison Kohlrieser came in with a 59 and Madison Sams finished with a 62. CELINA — Shawnee got singles wins from Aria Patel, Kunmi Ojo and Alotus Wei and doubles victories from the pair of Sanjana Rajaskaren and Katie Clark and Ella Atkinson and Dele Ojio. DALLAS, Ga. — Southside Spartans posted wins at the Georgia Amateur Boxing Association National Tournament at the Speedy Rays event center Aug. 17-19. Losses for Lima were Jordan Vogt, Mathew Coleman, Kenyen Rettig, Tyler Sherrer, Aidan Vogt, and Brady Kurtz. Next stop for Lima”s Southside Spartans Boxing gym is Lexington Ky. Sept 29. The Two-Man Better Ball tournament will take place on Sept. 22 at Hidden Creek Golf Club and Sept. 23 at Colonial Golfers Club. The tournament is presented by the Orthopedic Institute of Ohio. 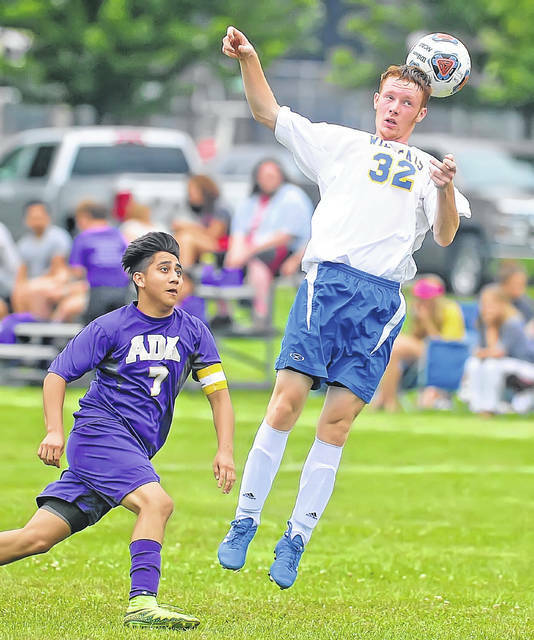 https://www.limaohio.com/wp-content/uploads/sites/54/2018/08/web1_Ada-vs-MC-RP-001.jpgMiller City’s Nick Gable heads the ball over Ada’s Christopher Reyes during Monday’s match at Ada War Memorial Park.